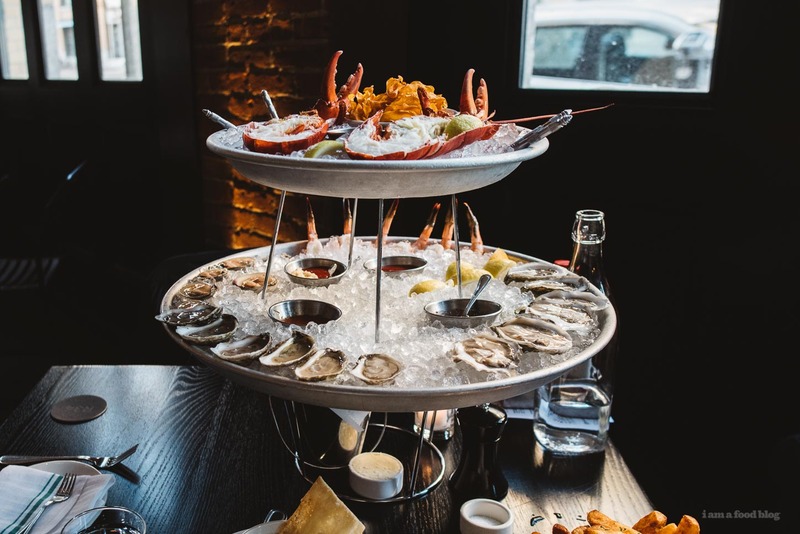 Boston, give me all your seafood towers and I will gorge myself and then fall into a seafood-y sleep only to wake and eat more. 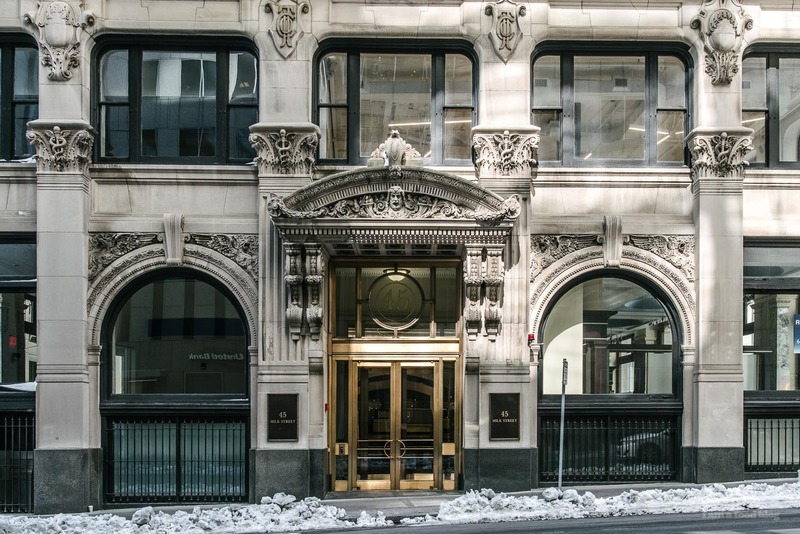 I love the fact that this gorgeous building was on Milk Street. If only all streets were named after food! Seafood towers make me really excited. I can still remember my very first ever seafood tower. It was with Mike, very early on in our budding romance, at a downtown Vancouver institution. I had a day off from work and it was a gloriously sunny spring day, something that is rare in our grey city. The sunshine had a celebratory sort of feel to it and to make it even better, Mike took me on a surprise date. We sat on the patio and Mike ordered a seafood tower. I had never had one before and I’m not sure if Mike was trying to impress me, or if it was just because he had a thing for seafood, but when it came I straight up turned into the heart-eye emoji. It was glorious and ever since then I’ve been a huge fan of seafood towers, because what could be better than sunshine, icy-cold fresh seafood, and your favorite person? 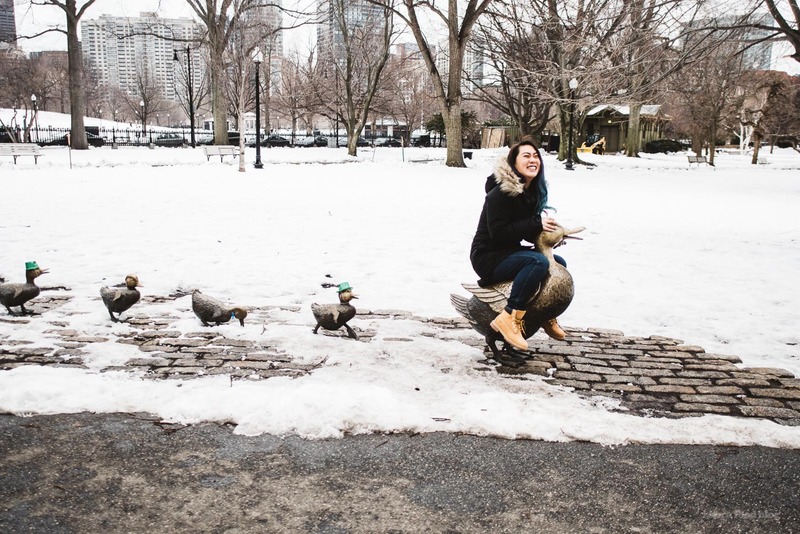 Couldn’t resist taking a ride on the mama duck from Make Way for Ducklings! Answer: snow, icy-cold fresh seafood, and your favorite person. Those three things happened last month, in Boston. Mike spoke on a panel and I just had to tag along because I heard a rumor about Boston and seafood towers. It’s funny though, because Boston has never been on my to-visit list. Which makes the fact that I liked it so much all that more surprising. I’m usually the kind of person who likes a lot of hype (sometimes to my detriment) before going to a city. But this time around, having low expectations — I know that sounds horrible — made it so much more enjoyable. Mike and I did a little bit of research (gotta know where the fresh stuff is) and spent the 4 days we were there wandering around, eating all the seafood towers. We ended splitting our stay between Downtown and the South Boston Waterfront, which is not something we normally do (move hotels) but it worked out because we got to explore the city on foot, while having two different home bases. 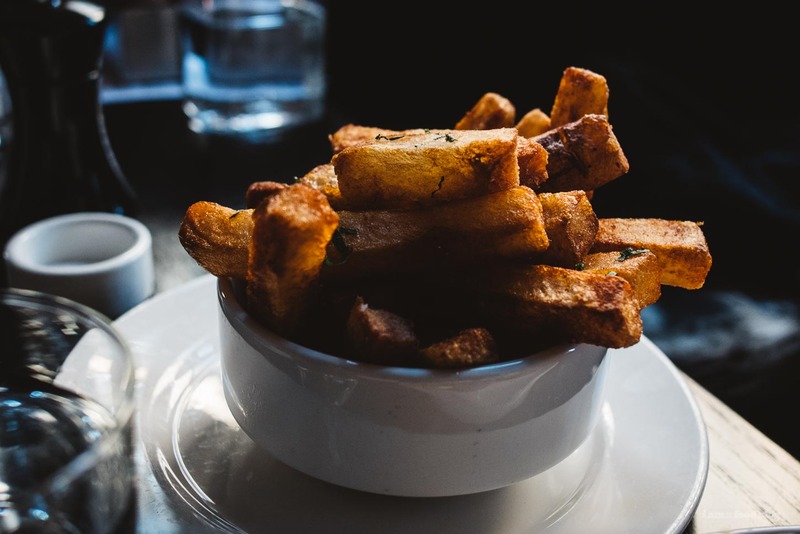 These fries were an amazing contrast of crispy-crunchy outsides and creamy insides. Starting our trip off in Downtown was nice because we were right near the Freedom Trail, Faneuil Hall, and Boston Public Market. Boston is pretty compact, which is nice. It’s also how we ended up walking to Cambridge, to check out Harvard. On our way there we stopped by Tatte for coffees and a pistachio nut tart. I was really looking forward to it because I’d read so much about how delicious they were, but sadly, it was a case of looks-better-than-it-tastes. I took two small bites and popped it in my bag, to save for later. I totally forgot about it while we were walking, but by the time we made it to Harvard, I felt like my arm was going to fall off. I started going through my bag to see what was so heavy when I discovered the tart. I sheepishly fished it out, then I shamelessly ate it because carrying a heavy nut tart in your tummy is better than carrying it in your bag? Turns out carrying things in your tummy is the way to go, in Boston. We filled our stomachs many times over, mostly with seafood, but we snuck in some burgers too, because Shake Shack. I really liked the Seaport District. It houses a Shake Shack (forgive me, we don’t have a one here and I really like burgers), Flour Bakery, and was a fun area to explore. There were a lot of old school factories and a really nice section of the Harborwalk. I ended up liking staying there a lot more than staying in Downtown. It was much less busy than Downtown and walking from the Southside into the city took no time at all. You also get to look at the harbor when you do it, so that’s a plus in my books. All in all it was a nice introduction to Boston. We’ll be back Beantown! 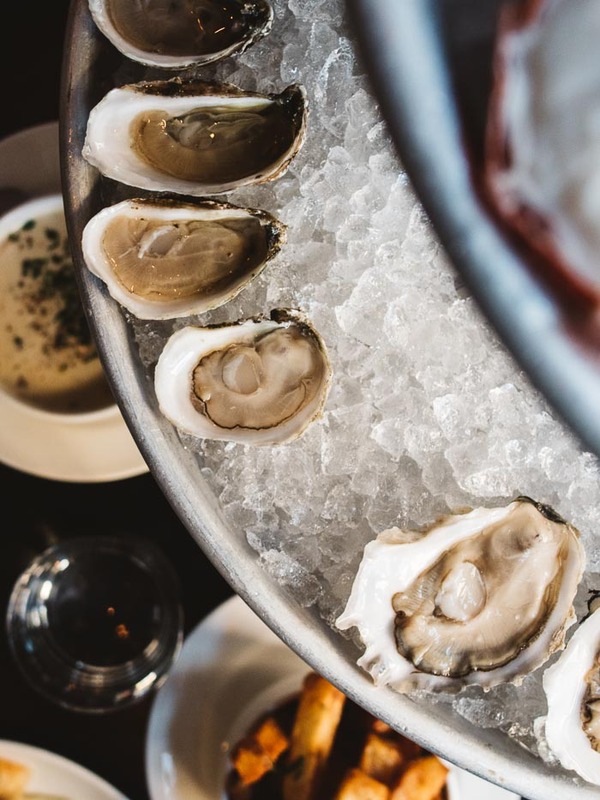 Row 34 – We had the seafood tower here and it was so good that we went back a couple of days later to have even more oysters. 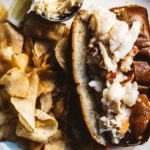 The 242 fries were excellent and the lobster roll (the lead in this post) was fantastic. 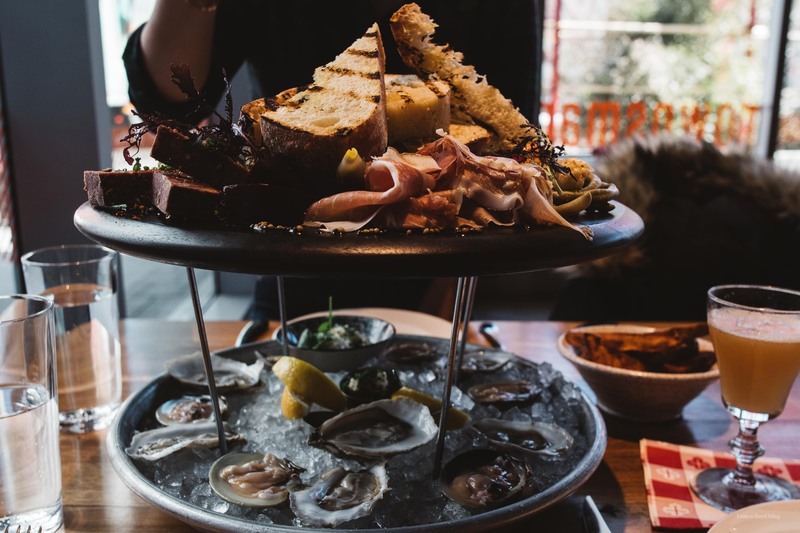 Townsman – They had a fun seafood & charcuterie tower but heads up, the service wasn’t the greatest. 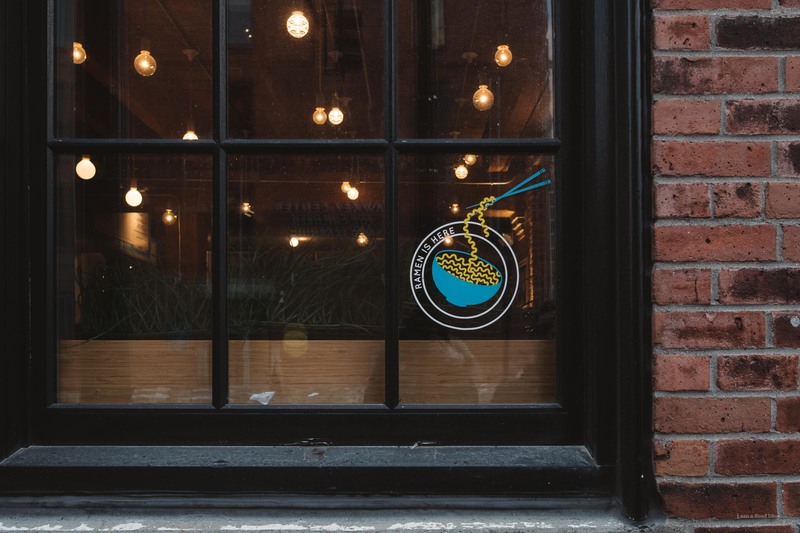 Myers + Chang – Mike loved the spicy prawns, but on the whole we found the dishes a touch on the saltier side. Ogawa Coffee – I requested a bear in my matcha latte and they did it! Cute and delicious. 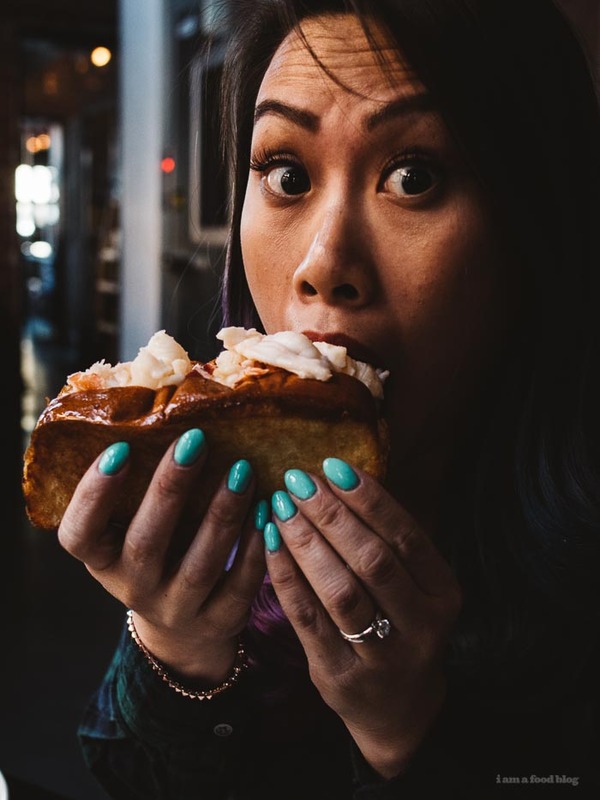 Flour Bakery – I didn’t dig Myers + Chang, but boy can Joanne Chang make banana bread. It was SO good. And I’m happy to report that Flour’s banana bread doesn’t have a domed top, so I’ve been making it right! Union Square Donuts – We had a Boston creme donut because you can’t go to Boston without having a Boston creme. It was fluffy, dense, and delicious. wasn’t trying to impress, that’s just my style. but, if someone told me i had 5 minutes to build a rapport with anthony bourdain, i’d order him a seafood tower and geek out on the pros and cons of using the top tier for lobster (i’m not a fan, raises the expense and you don’t really get time to appreciate it – lobster is best alone, like drake). also, boston has raw clams in their towers. 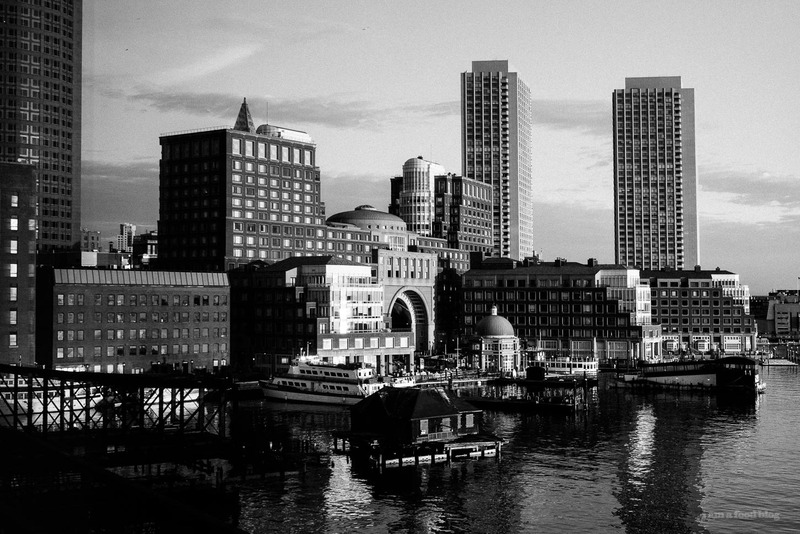 that by itself makes boston worth visiting. Alive and Kicking is the best! Omg, yum to all of this. Oh, and I LOVE the shot with you in it. okay good! i was wondering about flour bakery banana bread and why when ive made her recipe, mine didn’t dome either!!! for some reason, i’m not particularly interested in visiting boston either; i think maybe the masshole reputation is what’s putting me off? your post convinced me to check it out otherwise though! Boston has always been a “city on a hill” for me, and ever since I moved here 14 years ago I’ve never wanted to live anywhere else! I like that it’s smaller than NYC but still has a lot of the perks of being in a metropolitan area like restaurants, museums, etc. Also, you can’t beat (literally) the winning streak that the sports teams here have had the last dozen + years! 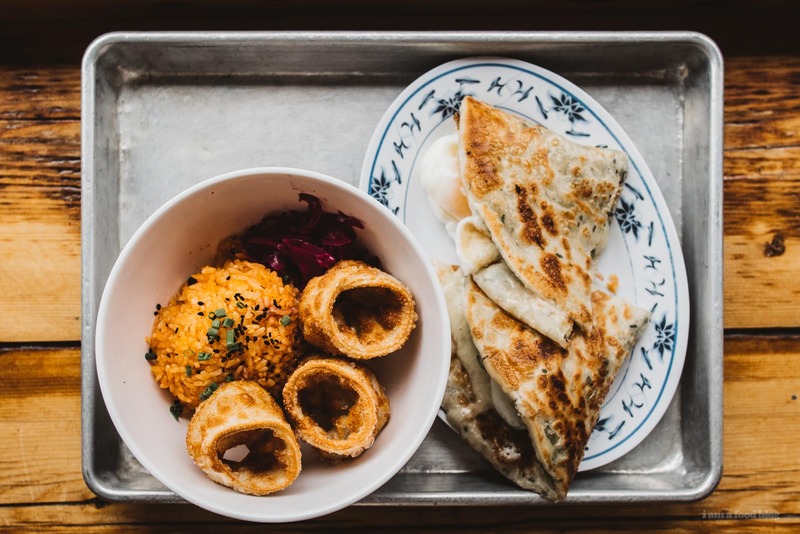 If you ever come back, I’d recommend checking out the tasting menu at Pagu, a new Spanish-Asian fusion place that opened up in Cambridge and the lobster rolls at Neptune Oyster. 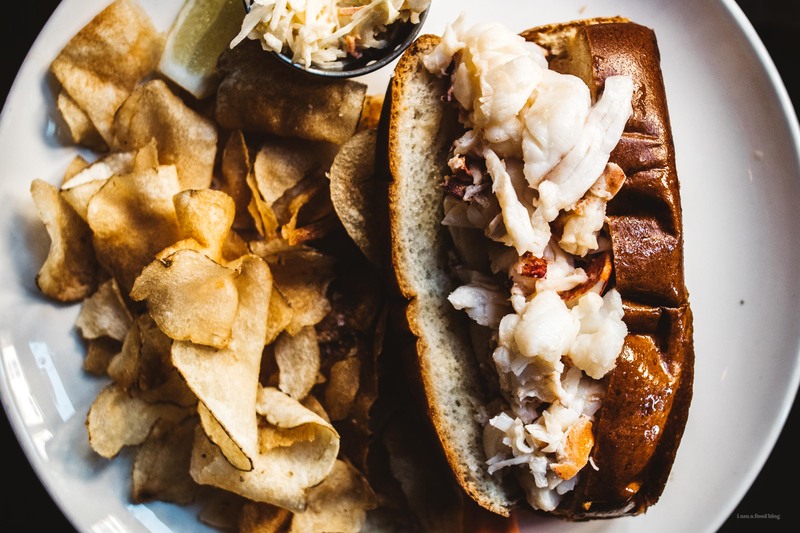 Then spend some more time exploring New England by taking a road trip up to Portland, Maine for the lobster buns at Eventide Oyster Co.
that tower though!! all the heart eyes. and your cute face with that gigantic sandwich. and YAYY for trying the real flour bakery banana bread!! so jelly!! I love this Steph!!!! These photos are so beautiful (and you are the cutest!) 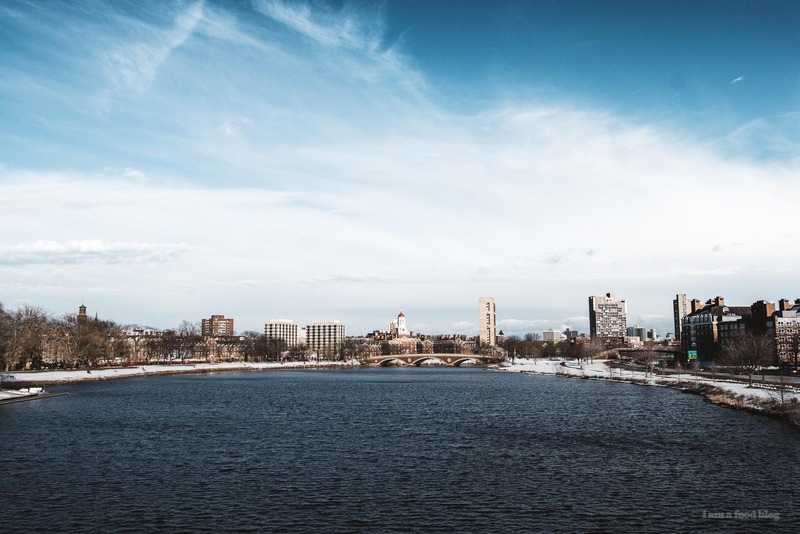 I used to go running right at the stunning photo you took of the Charles. This makes me so nostalgic for Boston! Also, hungry. You MUST go to Saltie Girl if you come back!!! !